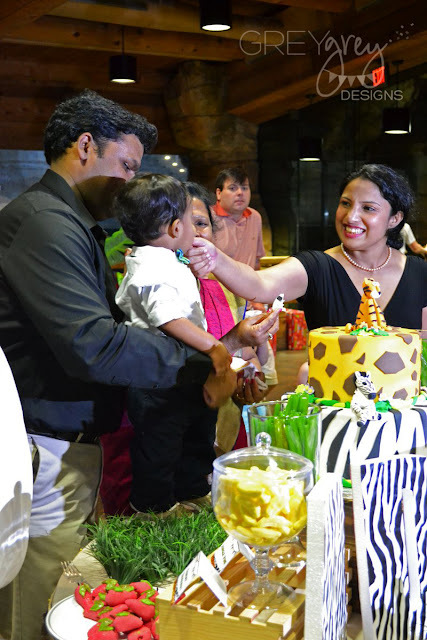 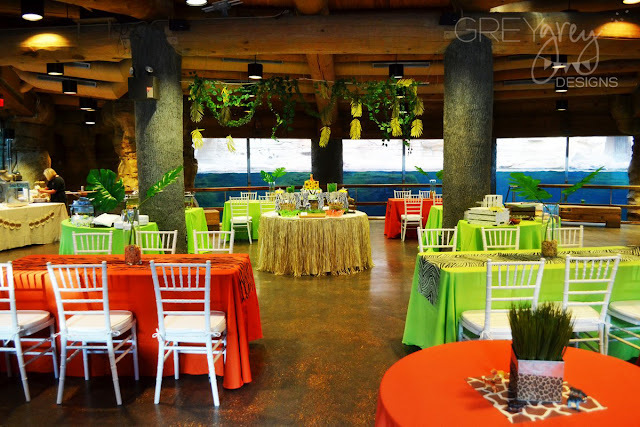 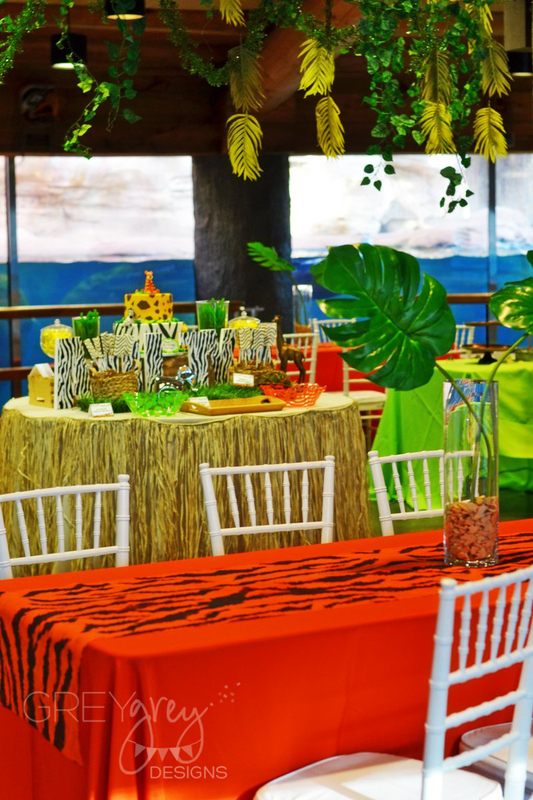 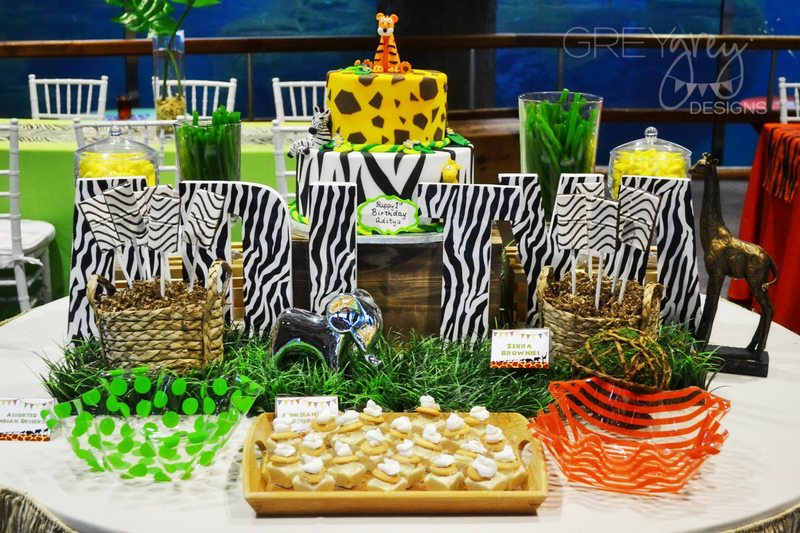 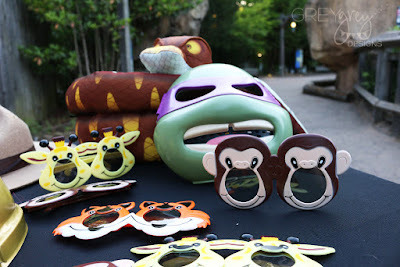 Who doesn't love a zoo themed party for a 1st birthday theme? 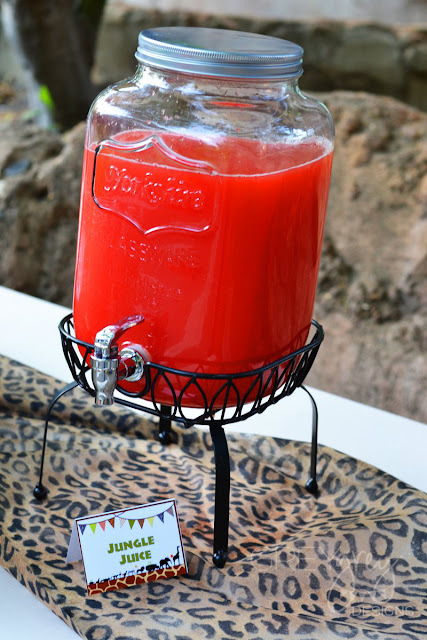 It's really a classic! 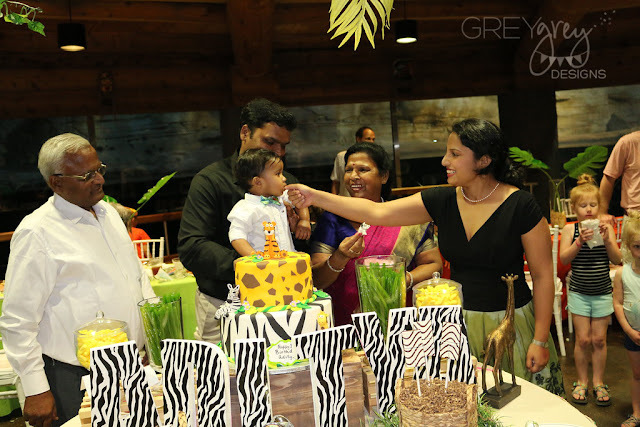 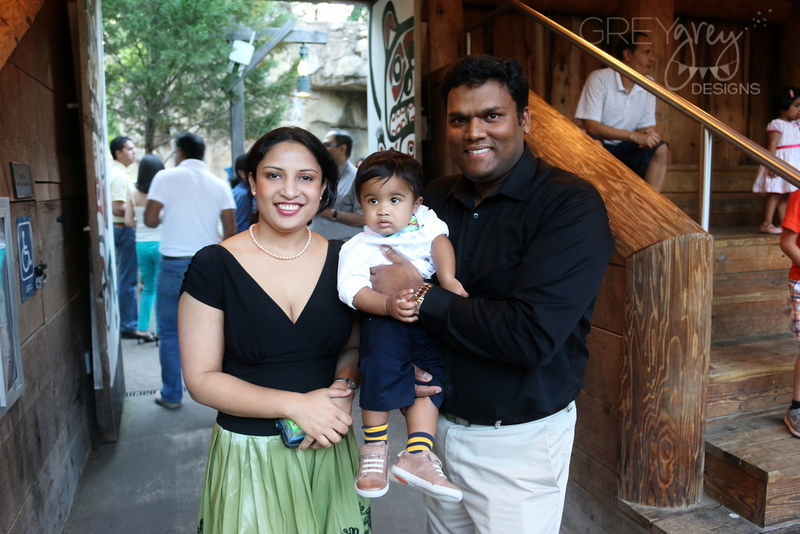 I had so much fun with this sweet family, making their little guy's 1st birthday party extra special! 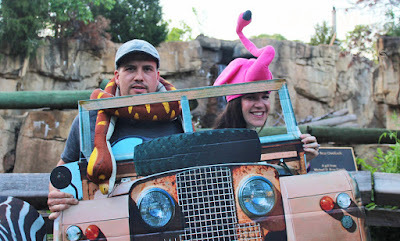 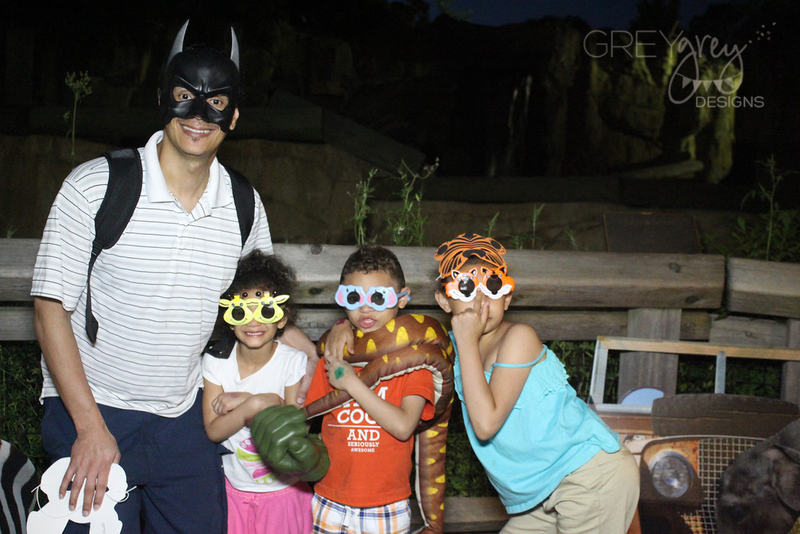 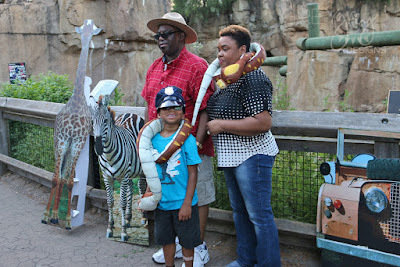 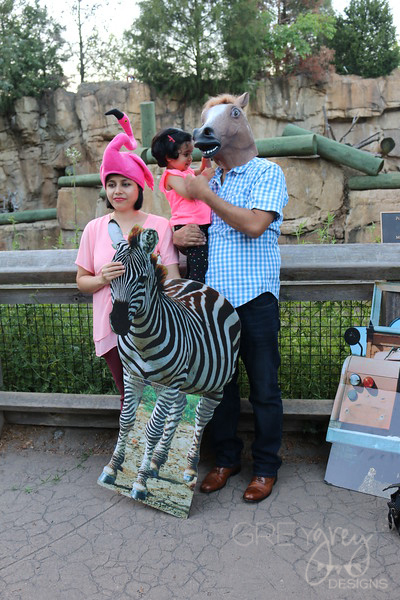 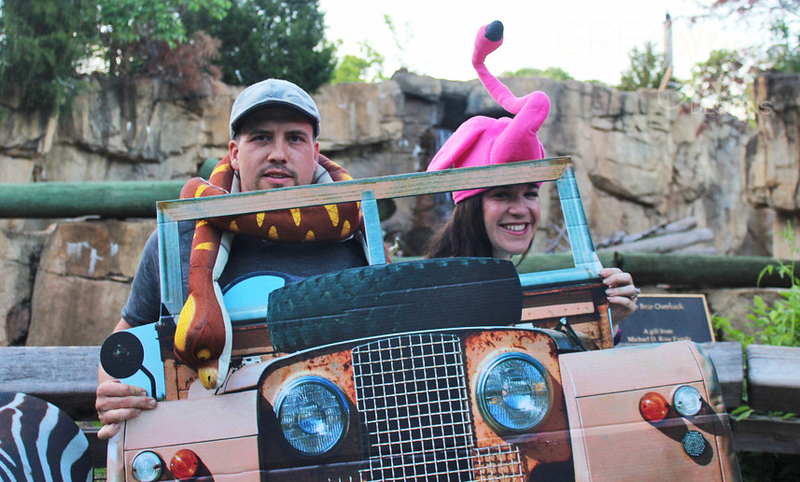 And where better to have a zoo party than at the fabulous Memphis Zoo?? 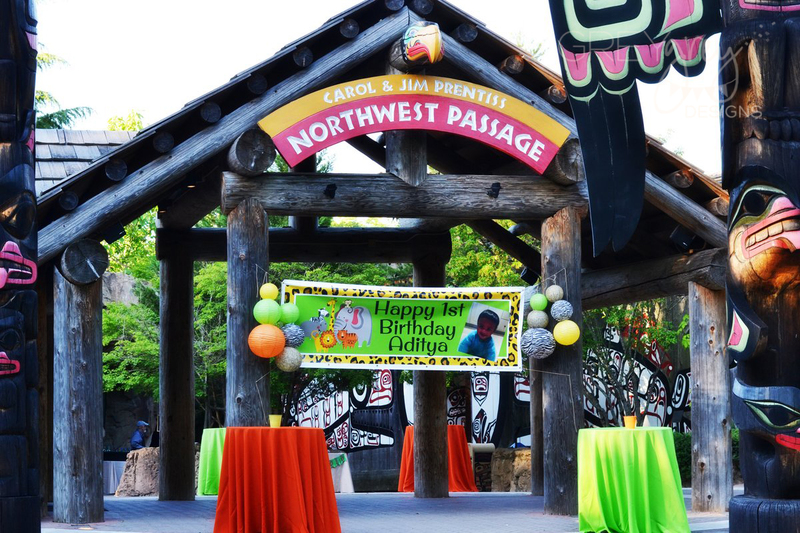 The host picked the beautiful Northwest Passage exhibit for their sweet boy's 1st birthday. 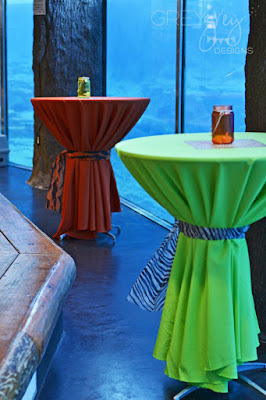 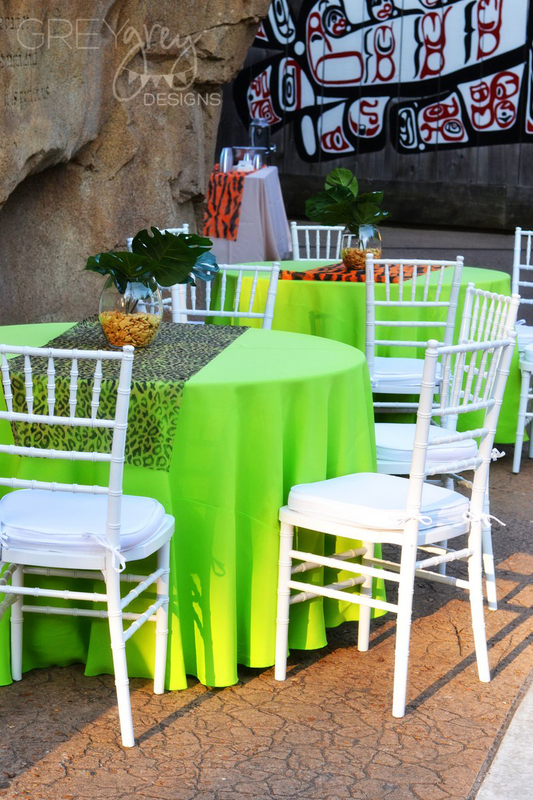 We decided on a color palette of lime green, true orange, and a touch of yellow, mixed with all the fun animal prints. 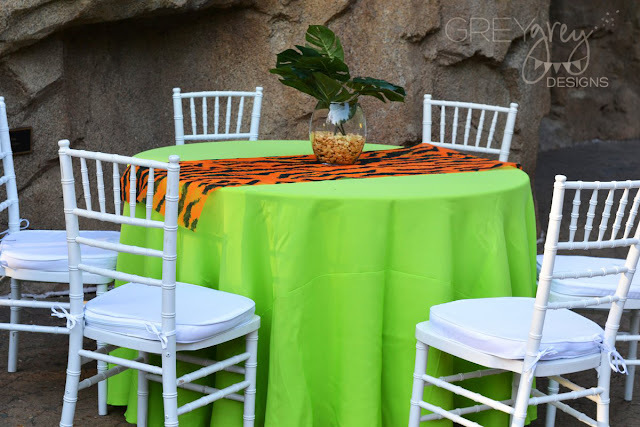 I used some simple solid colored linens on bistro tables in the courtyard to welcome the guests as they got off the zoo train. 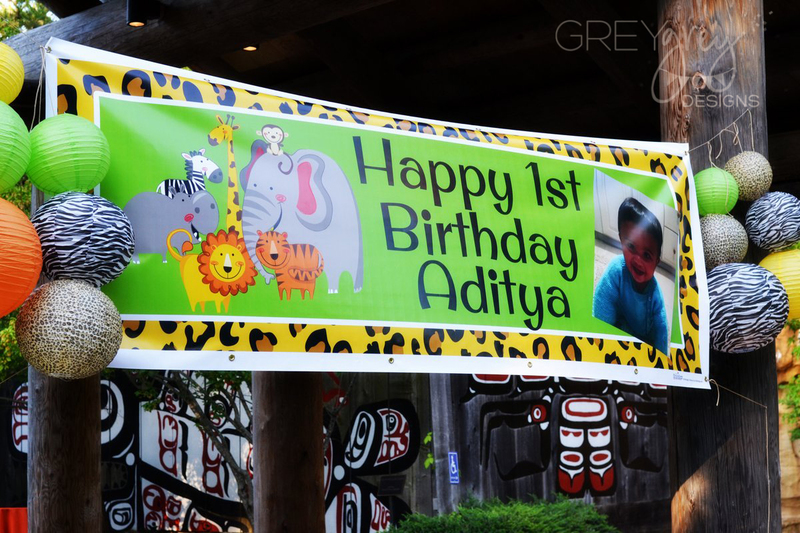 My friends at Shindigz helped with so many fun pieces of party decor, but my favorite was this personalized banner for the birthday boy! I surrounded it with animal print and solid colored lanterns. 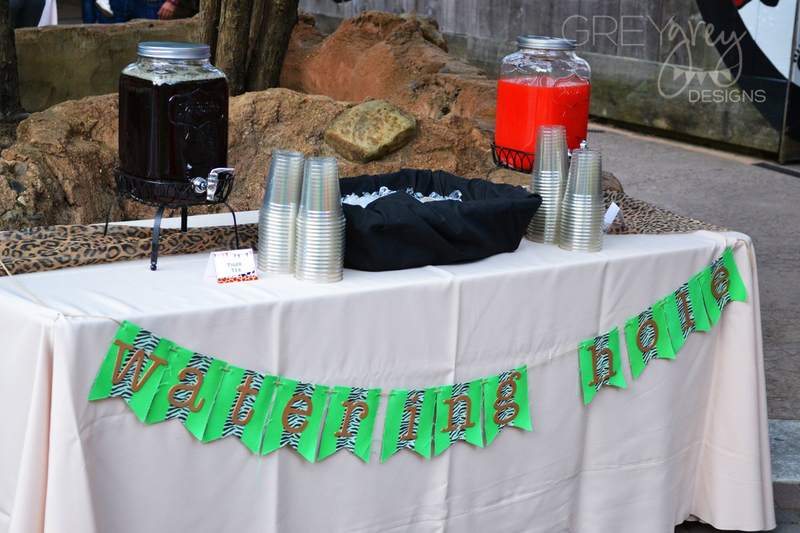 Since it was a hot day, as soon as the guests entered the exhibit, they were greeted with a beverage station which we renamed the "watering hole!" We added a few guest tables outside the exhibit as well. I created a really fun table runner for each table using animal print gossamer from Shindigz. 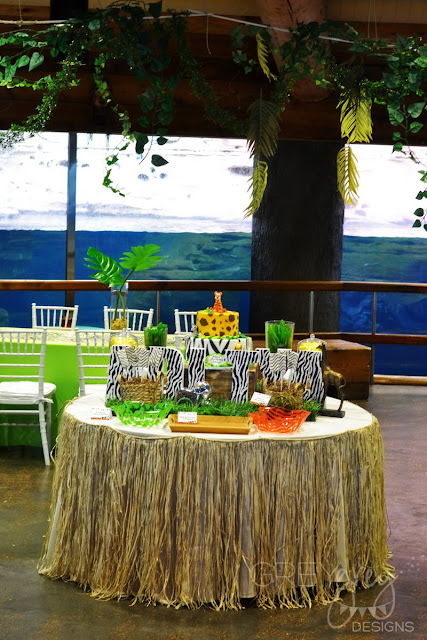 The centerpieces for these tables were simple glass vases filled with animal crackers and banana leaves. 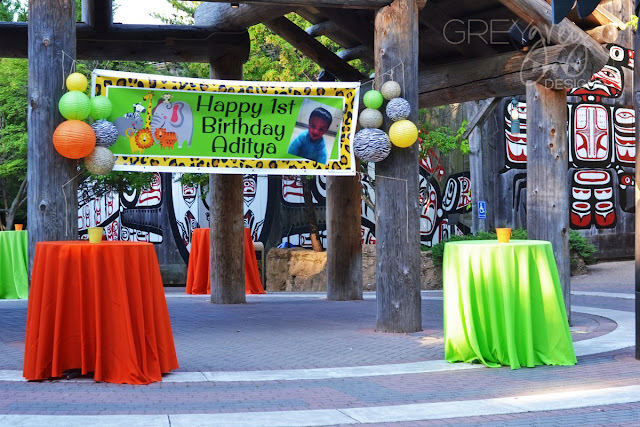 My favorite part of the party was the fact that there were live animals! Guests were welcomed by a couple of penguins! 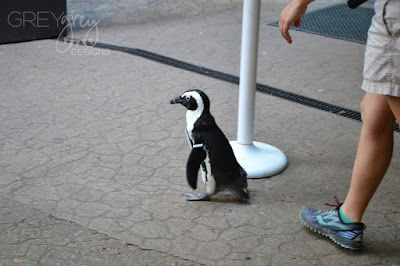 I got to pet one. Party planner perks! 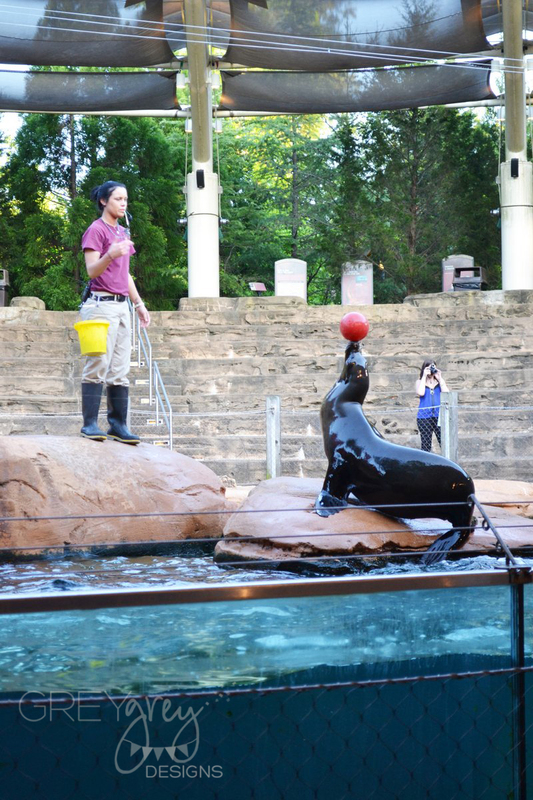 And, a live sea lion show was definitely the highlight! 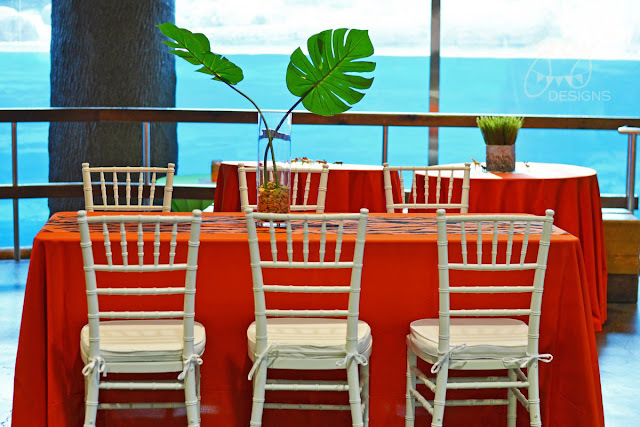 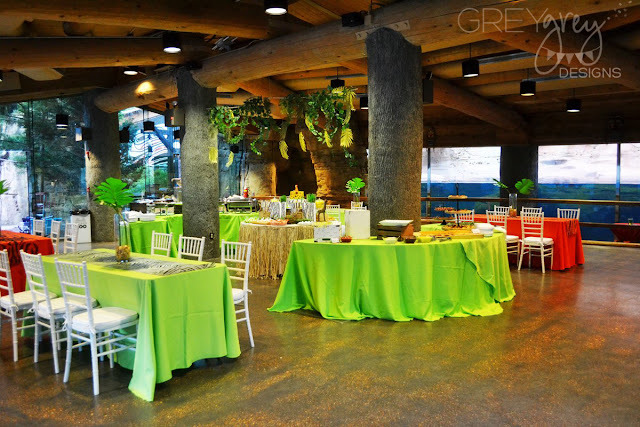 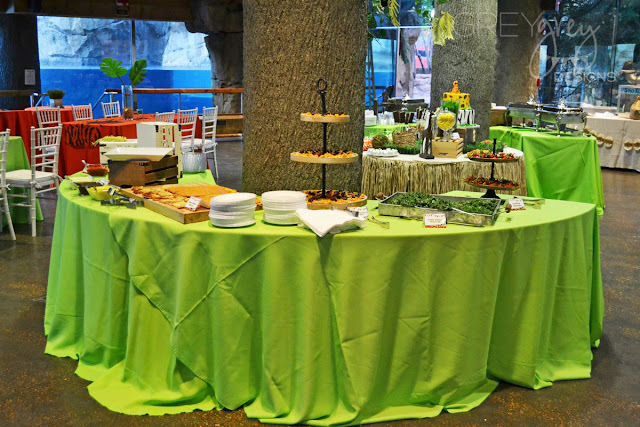 Inside the Northwest Passage exhibit, we set up all our food stations, as well are a lot more guest seating in our orange and green color palette. Above the cake table, I hung a large installation of vines and greenery to make it look more intimate in the large space. 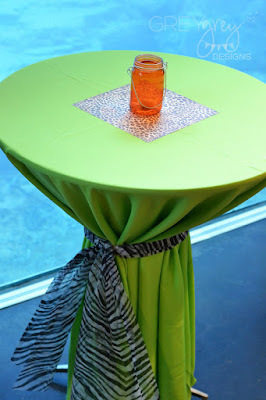 I love how these tables turned out! How fun is that animal print gossamer? 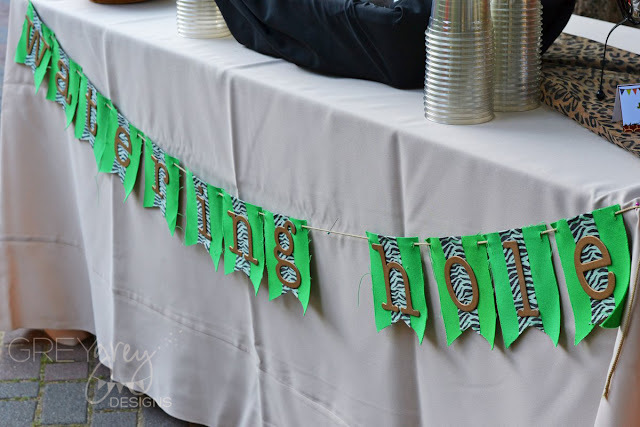 That's such an easy way to add a fun pop of print for a very small cost! 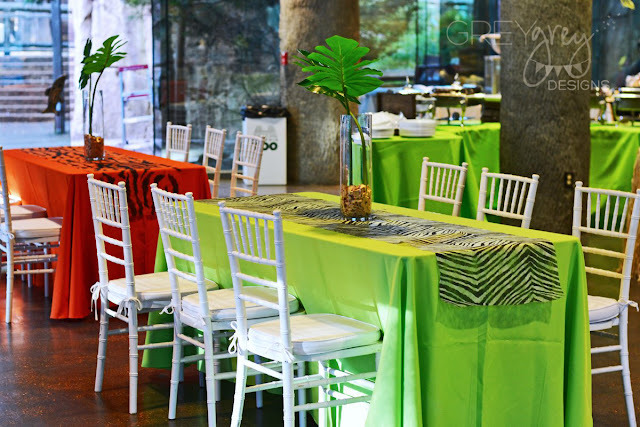 Around the lower level of the exhibit, I stationed a few bistro tables. 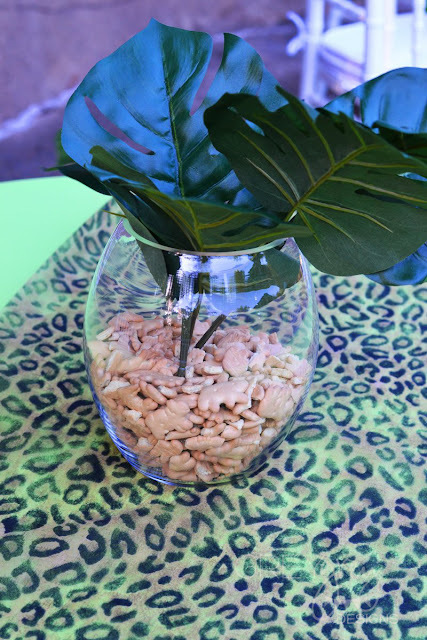 On the kids table, I picked up these cute grass centerpieces at Home Goods and personalized them by adding leopard crepe paper around the bottom. 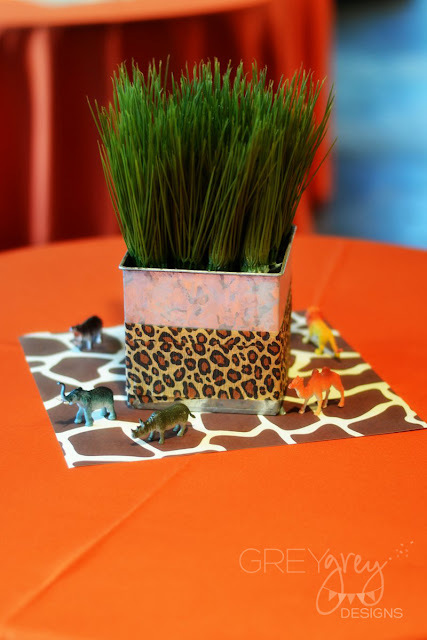 Then, I scattered some small plastic animals around for the kids. 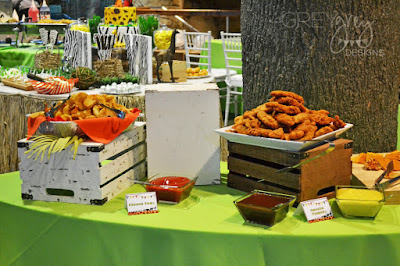 The cake table was our party centerpiece! 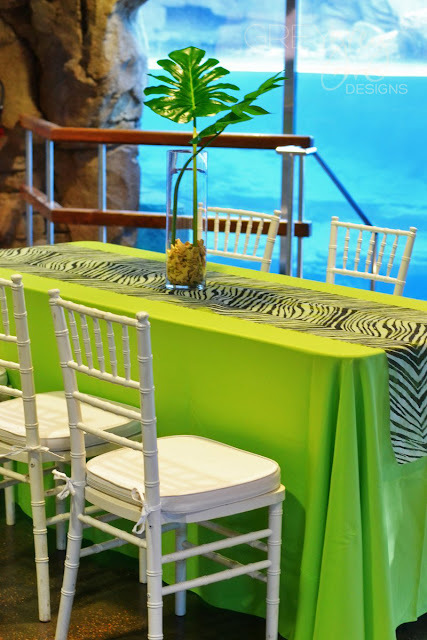 I made it look special by adding several grass skirts around the perimeter of the table. I wanted to add the birthday boy's name, so I bought some zebra patterned wrapping paper and glued it to the front of these styrofoam letters, spelling out his name. 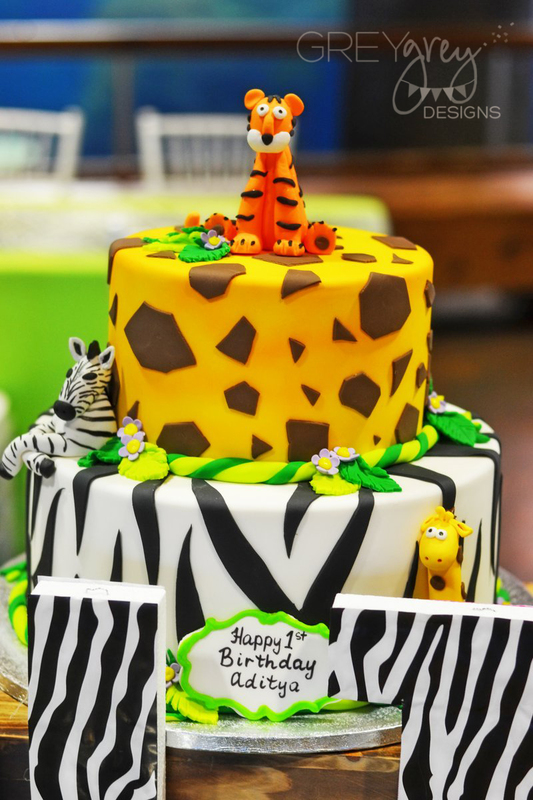 This amazing cake by Oh My Ganache was simply amazing! It's just too gorgeous to cut! 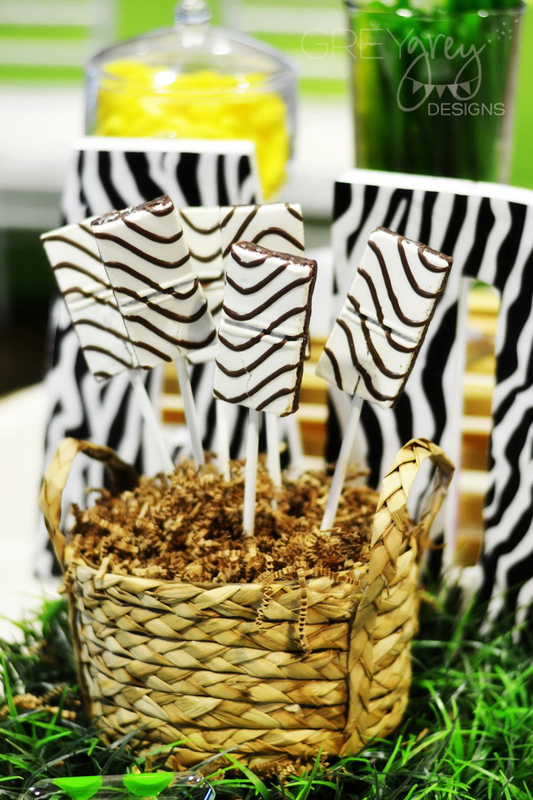 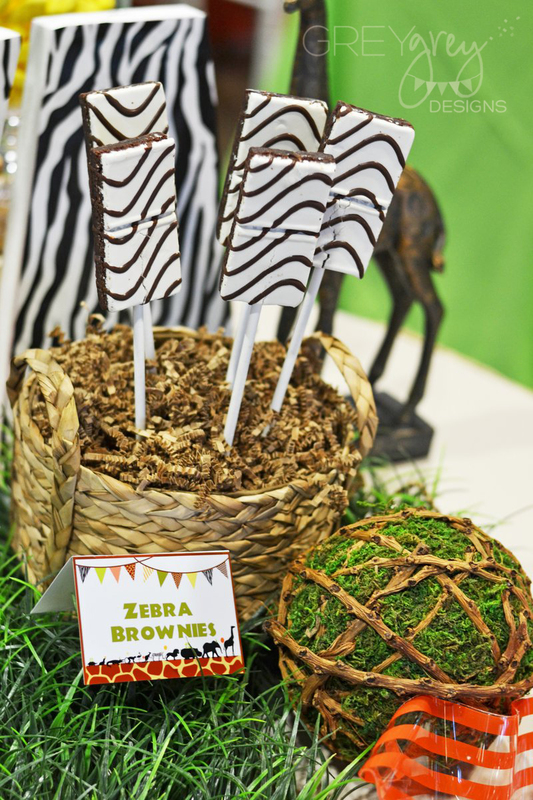 I always love serving a zebra cake at my zoo parties, but I also found these zebra brownies! 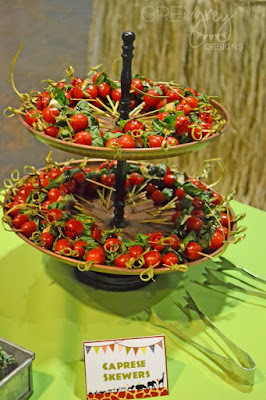 I put them onto sticks and displayed them in these fun rattan baskets. 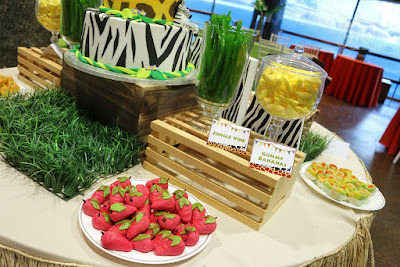 We also served some really fun sweets and treats along with our cake. 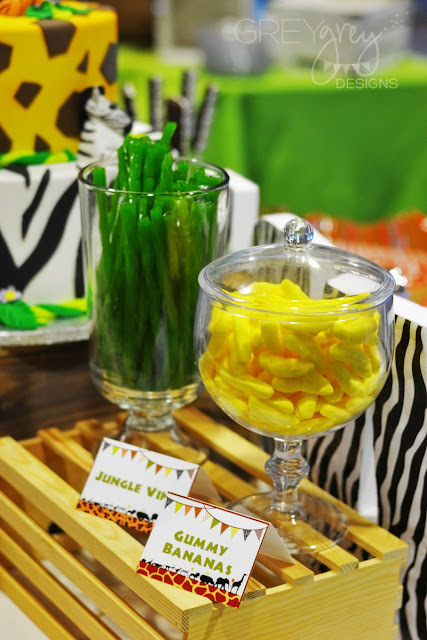 Green apple licorice (jungle vine), banana gummies, and mini banana pudding shots were just some of the selection of sweets. 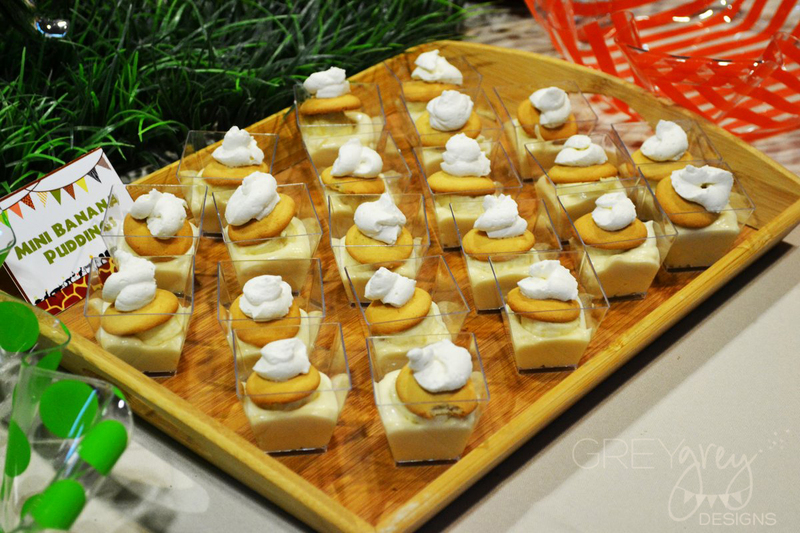 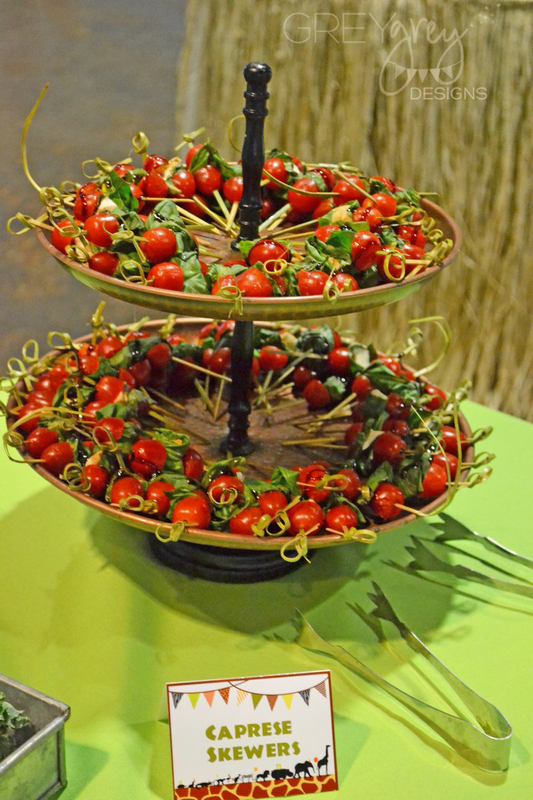 There was also a large display of savory food and Indian cuisine from A Moveable Feast. 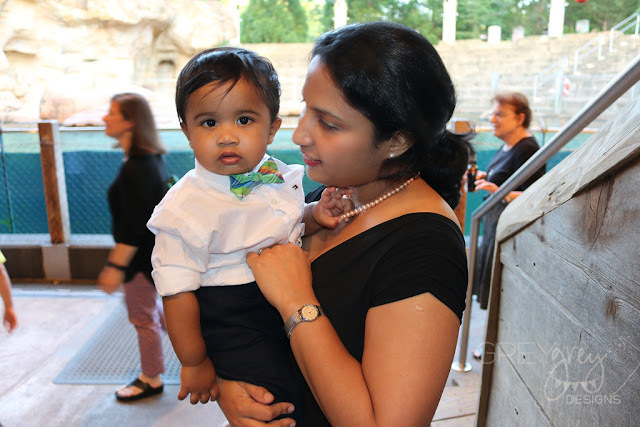 And how CUTE is this birthday boy? So squeezable! 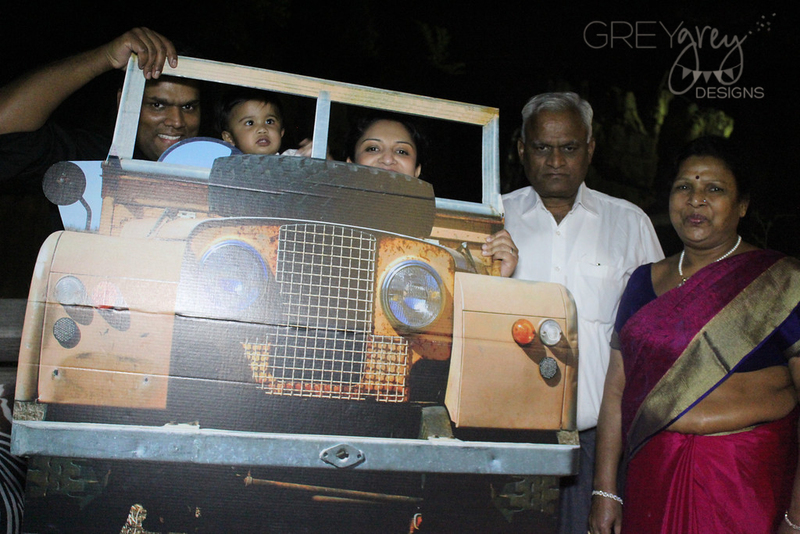 Outside, we had a photobooth for the guests with a bunch of fun props!